I’m not sure if I’ve accidently clicked something, but the automatic indent in my Python window seems broken. If I hit enter twice to get a blank line, the cursor goes way over to the left - not the 4 space standard indent. I’m on R20.057. Any ideas ? 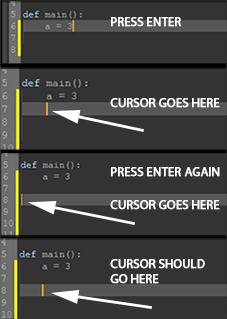 Not in your version, but yes the cursor should indent when you hit enter. Hi, I’m Maxime from the SDK Team of Maxon, I can indeed confirm the issue and I’ve filled a bug report. Please for Python/Console bugs report them on plugincafe.com. The official cinema 4d plugin development forum , and the only one we tracks daily. If you never send us (to maxon) bugreport, bugs will never be fixed. Thanks for reply. I think this issue arose with the R20.057 update - I loaded a Macrium image from about 1 month ago (with version before R20.057) and the Python cursor was OK. This, however, wasn’t a fix because my R20.057 render nodes now say ‘wrong version’. Yes this is a bug introduced in R20.055.